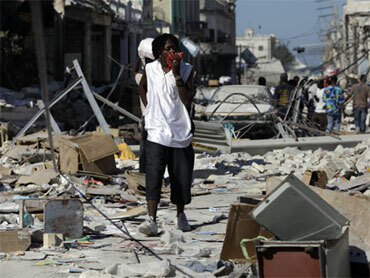 The United Nations says post-earthquake looting of its food supplies in Haiti's capital appears to have been limited. U.N. World Food Program spokeswoman Emilia Casella says officials in Port-au-Prince have recovered most stocks from four warehouses in the city, and would be handing out 6,000 tons of food aid shortly. She says earlier reports the U.N. had received of looting appear to have been overblown. She said 6,000 tons of food stored were found in a damaged warehouse near the capital's Cite Soleil slum. That is about 40 percent of the U.N.'s pre-quake food stocks in Haiti. Casella said there are six other U.N. warehouses outside the capital, and there were no reports of looting from those. The U.N. World Food Program had 15,000 tons of food aid in Haiti prior to Tuesday's 7.0-magnitude earthquake, stocks designed for hurricane relief. Spokeswoman Emilia Casella said local partners reported that the U.N. warehouse in Port-au-Prince's Cite Soleil neighborhood was looted but the agency did not know how much aid was stolen or exactly when it was taken. Casella noted that regular food stores in the capital also "have been cleaned out" by desperate Haitians since the quake killed thousands and left countless more buried under the rubble. Distributing food and clean water to hungry and thirsty quake survivors is the top challenge of the early relief effort. Looting, bad roads, a ruined port, an overwhelmed Port-au-Prince airport and fears of violence meant most Haitians have received no help three days after the quake. United Nations peacekeepers patrolling the capital said people's anger is rising that aid hasn't been distributed quickly, and the Brazilian military warned aid convoys to add security to guard against looting. "Unfortunately, they're slowly getting more angry and impatient," said David Wimhurst, spokesman for the Brazilian-commanded U.N. peacekeeping mission. "I fear, we're all aware that the situation is getting more tense as the poorest people who need so much are waiting for deliveries. I think tempers might be frayed." CBS News correspondent Kelly Cobiella reports that with Haitian police virtually nowhere to be scene following the disaster, and troops from the U.S. still days away, gangs armed with machetes are ruling the streets of Port-au-Prince. With the stench of death and smoke lingering downtown, Port-au-Prince feels like a war zone, says Cobiella. Bodies are strewn everywhere. Families still in shock ask CBS News crews over and over, "Where is the help?" The U.N. was planning to ask governments later Friday for $550 million in humanitarian pledges for the Western Hemisphere's poorest nation. "The physical destruction is so great that physically getting from point A to B with the supplies is not an easy task," Casella told a news conference. "Pictures can get out instantly ... and that's important because the world needs to know. But getting physically tons and tons of equipment and food and water is not as instant as Twitter or Skype or 24-hour television news." The international community has already donated hundreds of millions of dollars and sent in the first of hundreds of doctors, engineers, soldiers and aid workers. But the U.N. and others still hadn't figured out how to deliver assistance through broken roads and crumpled buildings, with little machinery to clear the mess. They are also contending with masses of people gathered in Port-au-Prince's streets, few working phones and a massive influx of goods and personnel without an organized plan. Casella said her agency was working to collect enough ready-to-eat meals to feed 2 million Haitians for a month. U.N. humanitarian spokeswoman Elisabeth Byrs said peacekeepers were maintaining security in Haiti, despite the challenges. "It's tense but they can cope," Byrs said. "People who have not been eating or drinking for almost 50 hours and are already in a very poor situation, if they see a truck with something ... or if they see a supermarket which has collapsed, they just rush to get something to eat." Complicating the security situation is the complete destruction of Port-au-Prince's main prison. The international Red Cross, which visited detainees before the quake, said a few inmates died but that the vast majority - 4,000 - had escaped and were freely roaming the streets of the capital. "They obviously took advantage of this disaster," spokesman Marcal Izard said. Byrs said needs would increase in the coming days. Search-and-rescue operations remained the immediate focus, but Byrs said there was no need for countries and groups to send additional teams or field hospitals. There are 17 such teams on the ground and six more are coming. "The arrival of others could compromise the work of those who are on the spot and are searching the rubble," she said. "The priority for the moment is for medical teams." Byrs said 10 percent of the homes in Port-au-Prince have been destroyed, meaning there are at least 300,000 homeless people. In some areas, the quake crushed or left unusable half of all buildings. She also warned that "the issue of corpse collection and disposal" was becoming increasingly critical as dead bodies piled up on the streets. The World Health Organization said corpses should be treated with chemicals to prevent them from decomposing and buried in open ditches. But mass graves aren't recommended because that would prevent families from identifying lost relatives, said WHO spokesman Paul Garwood. "The scale of this disaster has overwhelmed all capacities," Garwood said. "There's an urgent need to get more and more body bags into the area so that we can properly handle these bodies."